Ever hear of a coffee table magazine? Eureka! 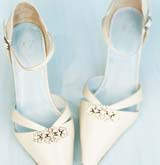 I found this season's issue of Real Simple Weddings, and christened it just that. From the quality paper stock on which it is printed to the stunning photos of gowns within, get this and you're in for a real treat. 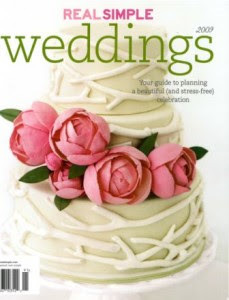 So what makes Real Simple Weddings more fine art book than magazine? For starters they've replaced all those in-your-face ads with thoughtful editorial; Real Simple covers everything to do with your wedding from timeline, budget, ceremony, attire, flowers and more. Especially awesome is the Attire Section. 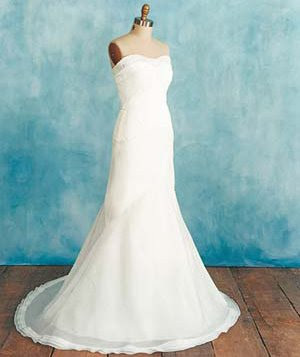 There's a lay out starting with how to find the right gown for your body type. Moving on, you're guided through gowns by season, the how-to of searching out the best accessories and one of the most helpful sections of all, 10 Common Attire Questions. While this feature is offered in every section, Real Simple keeps it just that and answers questions some books take paragraphs to cover and most mags only cover partially. 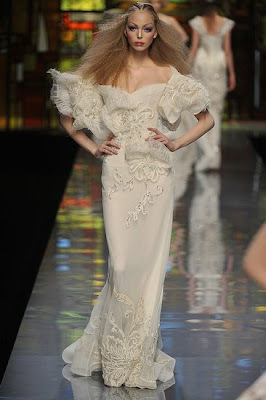 Living and breathing bridal fashion, I highly recommend this as a 'must have' for any bride-in-waiting, or those of us who appreciate looking at pretty things. It's that tangible piece of eye candy you can hold in your hands when you settle down for a cozy read. So where can you find Real Simple Weddings? Try Barnes and Noble or any Crate and Barrel Store. Also check out their website. Happy Reading and love to hear any comments you might have on it. 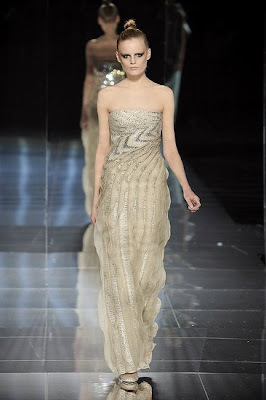 Love the drama of a long, grand gown? Today on Weddings Fresh you can see more of this kind of chic with an array of gorgeous creations by Italian designer, Elisabetta Polignano. Love the fabrics! 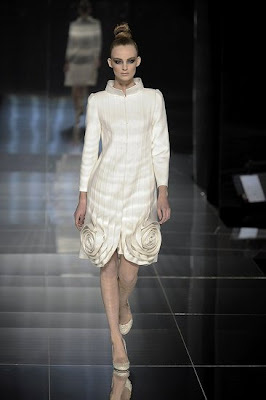 And catch what I have to say about this chic little dress. Yes, it's from Amsale's mini collection of little gems like this one. You can see more of her stunners up close on Savvy Scoop. Check out the new chic from my 'Dioresque' series, a capsule collection of 1950s-inspired dresses. 'Marisol' is the first off the work table. Inspiration for this dress along with a few other gems I'm working on began when my girlfriends all chipped in and got me about 16 yards of cotton Georgette for my birthday. Yes, you heard that right, cotton Georgette. 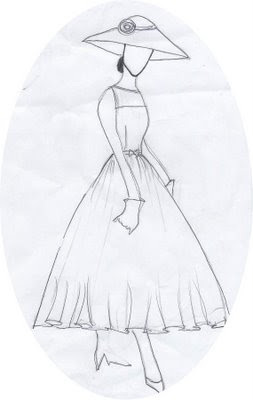 With this, I was able to make 4 samples with cinched bodices atop oodles of skirt and petticoats. Of course the cotton Georgette was a limited run and quickly consumed by my fervent sample making. However, I tracked down some practically identical linen Georgette. Also the linen is eco-chic. What I love about these tea-length dresses is they dress up well with accessories. We tried both hats and veils, gloves and no gloves; large and small florals, every type from carried-in-your-arms-like-a-newborn bouquets as well as those small nosegay arrangements. Just about everything works with this dress. 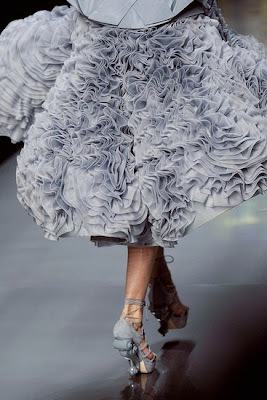 Personally, I love the 'New Look' wide-brimmed hat swathed in tulle. These photos are already up on my website and I've had so many comments, about this hat in particular. 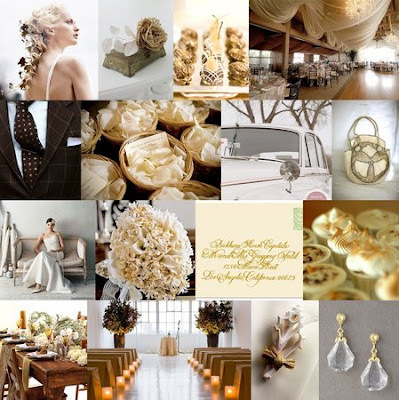 A little 1950s background here on bridal chic. 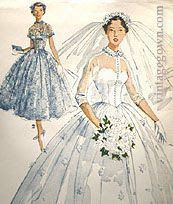 Back then it was trendy to wear sheer dresses made out of organza or Georgette over an under bodice. Liz Taylor's dress by Helen Rose for her role in Father of the Bride is a good example of the style and one widely copied by stores and manufacturers of the time. So is the pattern below. History, a site chock-a-block full of interesting info on the origins of hourglass silhouettes like these. Isn't she gorgeous! Believe it or not I met Polina via the 'will you model for me?' route. We set up a shoot for her to pose in some of my 1950s 'Dioresque' dresses. 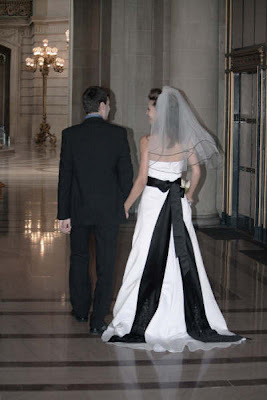 That's when I learned she recently got married at City Hall in San Francisco on Janurary 16. In the City by the Bay we have a city hall with one grand and glorious rotunda. True, most of the brides who celebrate here sport less formal chic than Polina's; this gown though is totally in tune with the magnificent backdrop. So what was Polina's wedding like? When I asked she told me, "After the ceremony we went to the Japanese Tea Garden in Golden Gate Park where we took some pictures. The reception was at the Carnelian Room Restaurant in the Bank of America building on the 52nd floor. It's really beautiful in there during the sunset." So was this stunning gown my creation? No, remember I met Polina only a few weeks after she and husband Daniel said, "I do". The dress is actually from Davids Bridal. I particularly love the black and white wedding theme here. When I asked Polina just how she put her whole wedding ensemble together, she said, "The shoes, sash and veil all came from David's Bridal. 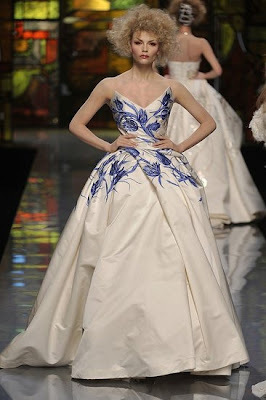 It was my design and idea to combine two colors in the dress. 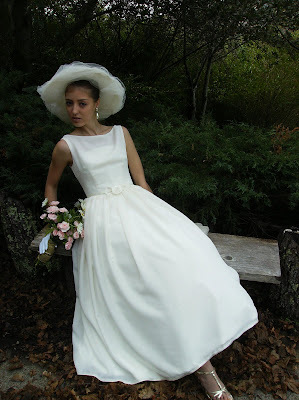 Originally the dress was boring plain white with a short green sash. I decided to go with two black sashes together - the short one gave the detail (the stones) in the front and the other one - the long one - had the details in the back. The veil was also white but had some black details in it." Pictured above are Polina and Daniel. Both are Russian and met in San Francisco 3 years ago. Personally, I think Polina is one of the happiest, most beautiful and radiant brides I've ever seen. And I've seen quite a few in my day . . . .
Kane's designs are accessorized here by Polyvore members. Bless them for contributing their own unique vision to celebrate this new, talented designer. I'm so much in love with all these delicate pastels and soft textures of Spring. We have so much to look forward to this season . . . I'm always talking about those fascinating new veils we've come to love . . . the hybrids. Neither veil nor hat but a combo of both. Stalking Polyvore, I found this head chic by Irresistible Headdresses that fits the scenario perfectly. 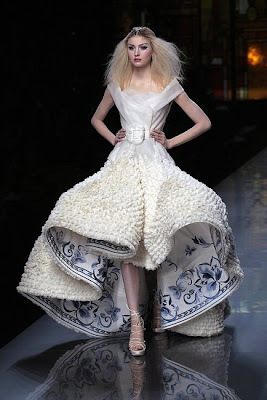 What kind of gown would you wear it with? And what sort of accessories do you see paired with this look? No you're not missing me today, I'm just elsewhere. Two places actually. 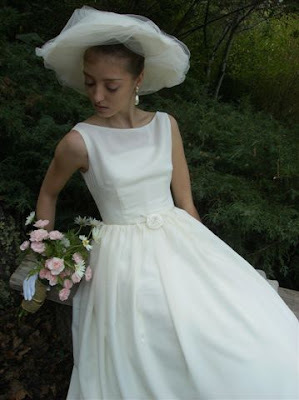 First, check out Weddings Fresh where I'll be covering Gown Friday once more. 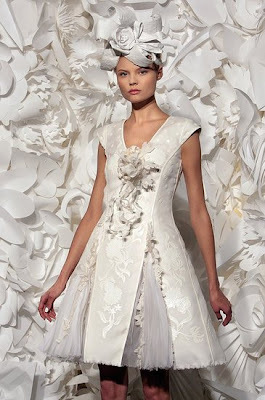 We'll be looking at the elegant creations of European designer Britta Kjerkegaard. Isn't the gown above just a knock out? You'll find a treasure trove of gold and iridescence from this designer. What will they think up next? 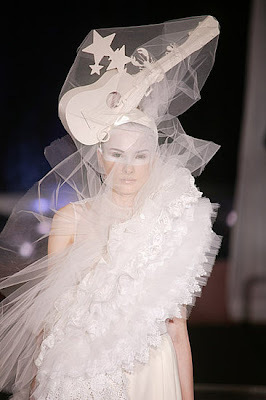 Has the guitar replaced the veil, you ask? This is one of Joseph Font's head innovations--one of many new trends you can check out on OneWed's brand new blog, Savvy Scoop. I'm so happy to announce I'm their regular Friday Guest blogger. 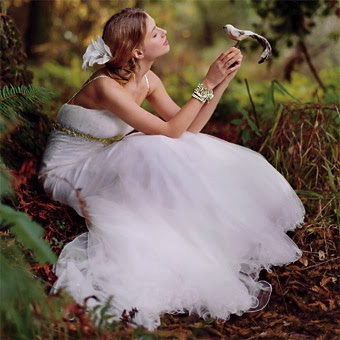 Each week we'll be looking at the ever changing world of bridal fashion . Today we'll start off with some Trends for 2009 and Beyond. I'll be back here on my own site tomorrow where I'll have a few comments on some very special head chic. 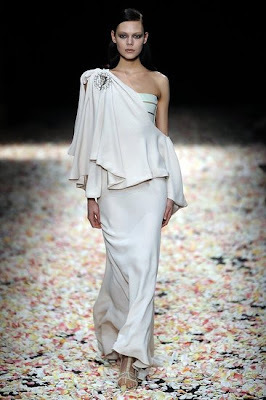 Of the Big Six of French Fashion Royalty, asked whom I think is the finest fashion house in Paris I'd say unequivocally the House of Dior is and always has been the pinnacle. Check out some of the imagination and technique on this season's creations. For me it's like looking at pure art. Oddly, Dior only ran his baby for ten years from 1947 till his death in 1957. After that it was the legacy of a succession of in-house designers interpreting a unique dialect of fashion Dior left behind. 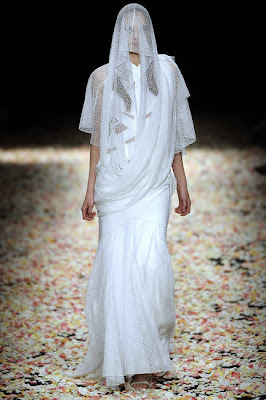 Givenchy concentrated on Grecian-inspired and flowing relaxed silhouettes this season. 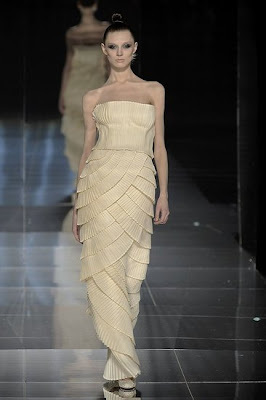 For me Gaultier's work is so solid in technique his whimsy seems more innovation. 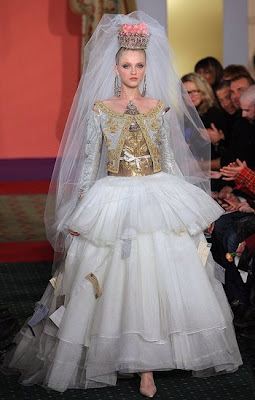 The level of his style is what Betsey Johnson might have reached had she been born and apprenticed among the French design elite and honed the wildchild in her. It's almost as if Mademoiselle herself were looking down upon her empire to this very day. 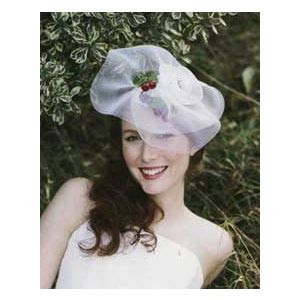 This bridal veil is magnificent sporting a bowl of fruit under layers of white tulle.